Straddling the Christian West and the Islamic Middle East, a resurgent Turkey has returned to the world stage. What’s next for this strategic nation? Sept. 11 marked the day that Islamic terror came to America 15 years ago. And on that day 333 years ago, all of Christian Europe was on the brink of defeat by a powerful Islamic army at the gates of Vienna. Early the next morning the armies of much of Christian Europe, summoned by the pope and led by John III Sobieski, joined battle with the Islamic army and in a decisive victory drove back the Ottoman Turks and saved Europe. The West claimed supremacy in a civilizational death struggle. Never again did the forces of Islam seriously threaten Europe. Once the center of the Ottoman Empire, Turkey is again at a pivotal point in its history. Turkey hosts 3 million Syrian refugees dying to get into Europe, and it has used halting the flow of migrants as a bargaining chip to draw 6 billion euros and other concessions from the European Union (EU). Turkey also recently endured a failed military coup, a string of bloody terrorist attacks and new forays across the border in Syria. After surviving the coup plot, President Recep Tayyip Erdogan has been riding a wave of nationalism and religious fervor. Mosques all over Istanbul and Ankara called on people to gather in town squares and airports in defiance of the coup. Erdogan—who once declared that “minarets are our bayonets, domes our helmets, mosques our barracks, and the believers our army”—has pushed fast-forward on a previously creeping Islamization. These events have many wondering if this is Turkey’s “Iran 1979 moment.” Will the decades-long forces of secularism be overwhelmed, with Erdogan installing himself as a modern-day sultan, leader of an Islamic revolution and a new Ottoman Empire? Even as the bungled coup was winding down, Erdogan called the uprising a “gift from God” because it “will be a reason to cleanse our army.” Erdogan used the failed coup attempt as an excuse to swiftly purge all his political opponents in the government and military bureaucracies and then began cleaning out the universities and state schools. By some estimates, upwards of 40,000 Turks were arrested and another 100,000 were stripped of their jobs. There are reports that the country’s prisons are being emptied of criminals to make room for the new arrivals. Turkey forms a strategic land bridge between Europe and the Middle East, two key areas in Bible prophecy. Turkey also controls a crucial military sea gate—the entrance to and exit from the Black Sea through the narrow gap of the Bosporus. Should it choose to close this choke point, less than a mile across at its narrowest, the Russian Black Sea Fleet would be trapped. Due to its location, economy and military (the second largest in NATO), Turkey’s influence as a commercial gateway will undoubtedly grow. Turkey aims to be an energy transfer nexus, delivering natural gas (from the Caspian Sea across the Caucasus) and oil (from Iran) to the markets of Western Europe. “Turkey,” according Robert Kaplan, author of The Revenge of Geography, “joins Iran as a Middle East hyperpower, with pipelines running in all directions filled with oil, natural gas, and water—the very basis of industrial life” (2012, p. 301). The geographic advantage of being at the headwaters of the Tigris and Euphrates, combined with a massive dam system, provides Turkey with the ability to cut off as much as 90 percent of Iraq’s water intake from the Euphrates and 40 percent of Syria’s. Control of water to the arid Middle East makes Turkey a water power in the way that Saudi Arabia is an oil power. The greatest Ottoman sultans stamped their legacy with massive monuments. Similarly, the signature of Erdogan’s reign is gigantic, multibillion-dollar construction projects costing more than a quarter of Turkey’s annual GDP. Following on the heels of a grandiose 1,000-room presidential palace complex, 2016 has been dubbed the year of Turkish megaprojects, with the building of an airport slated to be the largest in the world; the world’s deepest undersea tunnel, designed to link Istanbul’s European and Asian shores; the colossal Gulf Passage Bridge; and a parallel canal designed to be a second Bosporus. The construction capstone is Turkey’s biggest-ever house of prayer: a stadium-sized mosque with a capacity for 37,500 people. The city’s largest current mosque, built by Suleyman the Magnificent—widely seen as the greatest of the sultans—has only four minarets, but Erdogan’s mosque, built in classic Ottoman style, dwarfs Suleyman’s with six minarets that can be seen for 20 miles. In 1945 there were 20,000 mosques in Turkey; in 2016 there are 86,000. And that number continues to soar out of proportion to the population—particularly in the previously secular large cities. But the grand mosque building program does not stop there. Erdogan is building and financing over 30 multimillion dollar mosque projects across five continents—from Maryland to Amsterdam to Moscow. The days of a sleepy, inward-looking Turkey are over. Previous Turkish leaders—from former President Turgut Ozal, who proclaimed the 21st century to be “Turkey’s Century,” to Prime Minister Suleyman Demirel, who spoke of a “Turkish world” from the Adriatic Sea to the Great Wall of China—gave voice to Turkey’s ambitions of becoming, once again, the hub of Middle Eastern Islamic power. Neo-Ottomanism—the restoration of Ottoman political and cultural heritage in the territories of the empire in the Balkans, Middle East and Caucasus—has become a major movement again. As we approach the end of this age, the Middle East will again be a flashpoint for spectacular regional and global conflicts between armies representing the crescent and the cross. “Europeans have viewed the Turks as alien for two reasons,” according to George Friedman, author of Flashpoints: The Emerging Crisis in Europe. “First, they were primarily Muslim rather than Christian, and therefore not fully European. Second, it was the Ottoman Empire that destroyed Byzantium, the successor to the Eastern Roman Empire that Constantine founded” (2015, p. 224). From the rise of the Ottoman Empire in the 13th century, Turkish leaders were mainly focused northwest, toward Europe, the source of wealth and lucrative trade routes. But following their defeat at Vienna in 1683, the empire receded over the next two centuries. It became “the sick man of Europe,” and World War I proved fatal. Only the old Anatolian heartland remained afterward as a secular, Turkish republic. Following World War I a military hero, Mustafa Kemal, led a revolution. Kemal, later called Ataturk—“Father of the Turks”—ended the Islamic caliphate in 1924, bringing Turkey kicking and screaming into the 20th century. Patterning a new secular state on a European rather than Islamic model, Kemal developed a modern army and introduced Western legal codes and the Gregorian calendar, while banning Islamic religious courts and public institutions. The traditional fez was forbidden, the Latin alphabet replaced Arabic script, and women were granted the vote long before they were in France or Italy. The relative stability, through the 1990s, of the “star of Islam”—as The Economist dubbed Turkey—was held up as an example of how a Middle Eastern country, other than Israel, could embrace democracy and grow its economy. Surrounded by a crescent of instability, Turkey joined NATO in 1952, firmly anchoring it as part of Europe’s safekeeping. U.S. tactical nuclear weapons based at Turkey’s Incirlik Air Base play a key part in this. Though a small part of Turkey (less than 5 percent) physically lies in Europe, the Turks have never been truly recognized as part of Europe by their neighbors, and it has become apparent that Turkey will never gain full membership in the EU. Were Turkey to become a full EU member, the implications would ripple across Europe’s political and religious landscape. It would nearly double the Muslim population in the EU. Turkey would become the No. 3 country in the EU because of its economic strength, its population and a military larger than that of France or Britain. Because admission to the EU would mean free movement for nearly 80 million Turks, it will likely never happen. 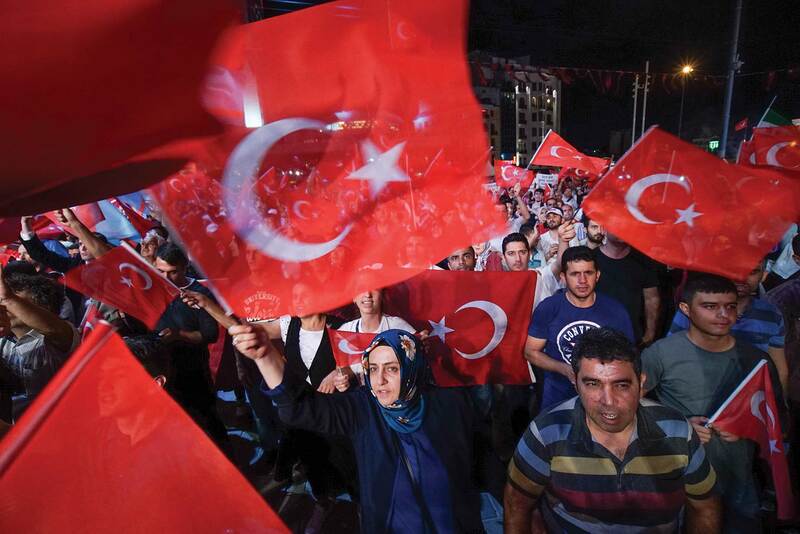 “The rejection,” writes strategist Robert Kaplan, “was a shock to the Turkish body politic. More important, it merged with other trends in society that were in the process of issuing a grand correction to Turkish history and geography” (p. 290). This, says Kaplan, began to “shift the political and cultural pendulum dramatically in the country toward the Middle East and away from the West for the first time in literally centuries” (p. 293). One of those shifts was the rise of a politician the Spectator called “the most powerful man in Europe,” Recep Tayyip Erdogan. Not since the days of Ataturk has any figure dominated the country for as long as Erdogan. To his supporters, he is a leader who has brought Turkey years of economic growth. But to his critics, he is an autocratic leader, intolerant of dissent, who has sidelined the old secular establishment and harshly silenced anyone who opposes him. Erdogan became mayor of Istanbul in 1994. Representing the pro-Islamist Welfare Party, he even went to jail for four months in 1999 for religious incitement. In 2002 Erdogan’s Justice and Development Party (AKP) was elected and began orienting Turkey away from its modern secularist history and toward the Ottoman past. Erdogan, it seems clear, dreams of transforming Turkey in ways Suleyman the Magnificent (1494-1566) would have admired. In the Middle East, where power does indeed flow from the barrel of a gun, Turkey has been expanding its military footprint—in Qatar, Iraq and Syria. Bible prophecy is heavily focused on events in the Middle East and Europe. As we approach the end of this age, the Middle East will again be a flashpoint for spectacular regional and global conflicts between armies representing the crescent and the cross. The book of Daniel speaks of a “king of the South,” possibly an Islamic caliphate, coming out of the Middle East and attacking the “king of the North,” meaning an end-time resurrection of the Holy Roman Empire of Europe (Daniel 11:40-41). This leader from the north will counterattack swiftly and even enter the “Glorious Land” (Israel). The exact role Turkey—increasingly Islamist and self-confident—will play in prophecy is yet to be seen. But Turkey’s strategic crossroads seem destined to draw it into a whirlpool of end-time events.